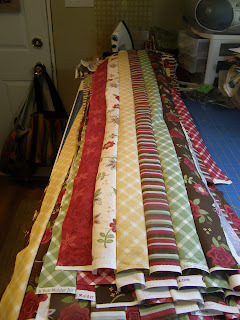 Now I have 44 strip sets that need ironed. Yippee. I was going to spend today doing that but I've been on a baking spree instead-banana bread, banana chocochip muffins, peanut butter muffins and these fabulous strawberry muffins. And now it is off for some Canada Day festivities and fireworks. Happy Canada Day! phew! I looked at those and thought there was a lot more than I had. 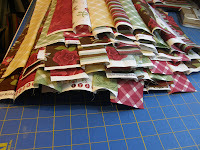 Glad you specified you were making it a larger quilt b/c I was starting feel like I fell down the rabbit hole. :) Love the fabrics! Oh...it looks like it will be beautiful! 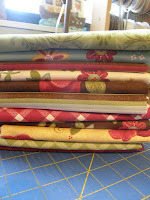 Love the fabric you choose!